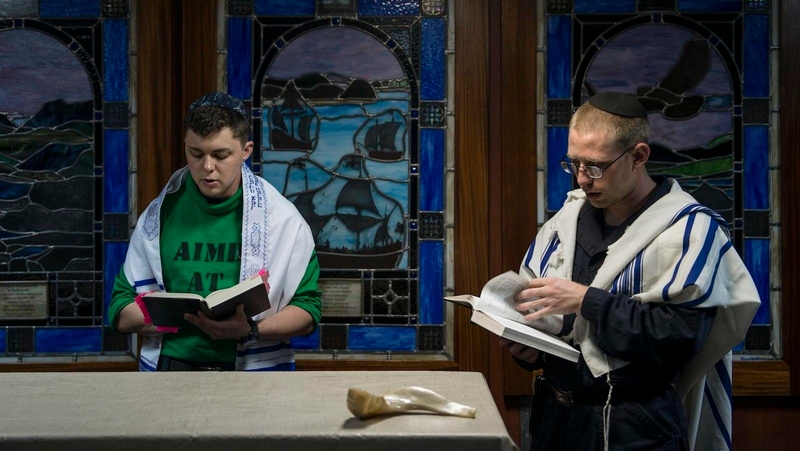 Highlights of the Jewish New Year prayer services. As one of the High Holy Days, Rosh Hashanah, the celebration of the new Jewish calendar year, is marked by the addition of numerous unique and elaborate prayer services. Understood by the rabbis as an annual coronation of God as the ultimate spiritual sovereign of the Jewish people–and, indeed, of the cosmos — Rosh Hashanah worship services are characterized by a pageantry intended to parallel the royal celebrations in ancient kingdoms. Note: This description of the holiday services for Rosh Hashanah is standard for all the movements with one exception. Those branches of Judaism that do not have the Musaf (additional) service, such as the Reform movement, add the shofar service and the Aleinu prayer that is part of it, to the morning service, after the reading of the Haftarah (prophetic selection). In addition, Rosh Hashanah is the formal beginning of the High Holy Days, the Days of Awe, in which Jews are called upon to begin a solemn process of introspection and repentance for past misdeeds. Therefore, in addition to the royal images of God prevalent in the Rosh Hashanah liturgy, there are numerous prayers dealing with our personal, internal spiritual life and external behavior and conduct. When is Rosh Hashanah 2018? Find out here. First and foremost, nearly every prayer and worship service of Rosh Hashanah is characterized by a special nusah, or body of musical themes and melodies. Both evocative and celebratory, the music of Rosh Hashanah is an occasion for great operatic innovation and displays of cantorial virtuosity. The silent, standing prayers — called Amidah prayers — of Rosh Hashanah are filled with numerous piyyutim, or religious poems, written and interpolated into the services over the span of centuries. Most of these poems emphasize the awesome nature of the coronation of God as king and speak of the inadequacy and terror of mere human beings in approaching God in prayer and praise. In addition, all of the Amidah prayers include entreaties to God to remember and inscribe the Jewish people in the book of life. In the rabbinic imagination, God was described as a heavenly scribe, recording all of the deeds of human beings and diligently writing them down in various heavenly archives: the book of life, the book of remembrance, the book of livelihood, the book of merit, and so on. On Rosh Hashanah, God records our deeds and on Yom Kippur God judges our spiritual fate for the coming year. Therefore, the Days of Awe are a time when all life on earth is subjected to God’s review and judgment. Read the full text of Avinu Malkeinu on Sefaria. The Torah and Haftarah readings for Rosh Hashanah all revolve around the theme of God remembering. In fact, Rosh Hashanah is known as the day of remembrance (Yom Hazikaron), referring specifically to the merit of our ancient ancestors and God’s covenant with the Jewish people, on whose behalf we implore God to be mindful of his people and inscribe us in the book of life. The rabbis assumed that since the present generation of Jews is completely unworthy of a favorable spiritual judgment, we have no recourse but to appeal to God’s mercy and the memory of the merit of our biblical patriarchs and matriarchs, as well as to the covenant that God established with them to sustain the Jewish people throughout all time.Therefore, the narratives and readings from the Torah and prophets on Rosh Hashanah emphasize these themes either directly or through implication. 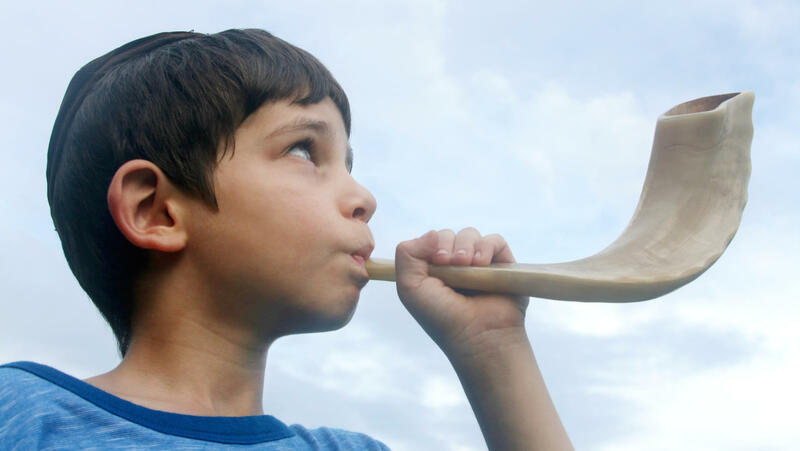 The most well known and beloved of Rosh Hashanah synagogue observances is the sounding of the ram’s horn, the shofar, to herald the beginning of the new Jewish year. The Torah describes Rosh Hashanah as “a sacred occasion commemorated with loud blasts.” (Leviticus 23:24) Several blessings are recited before the blowing of the shofar, then approximately 100 blasts are sounded throughout the rest of the worship services. The blasts of the shofar are divided into three kinds of blasts: tekiah, one long sounding; shevarim, three somewhat shorter soundings equal in length to one tekiah; and finally, teruah, a series of at least nine staccato notes, also equal in length to one tekiah blast. Among the various reasons given for the blowing of the shofar is that the coronation of kings in ancient times was supposedly marked with the sounding of a shofar. In addition, because Rosh Hashanah is also a time of spiritual introspection and repentance, the shofar essentially calls us back to our senses and serves to remind us to mend our ways. The Musaf or additional prayer service of Rosh Hashanah is also unique in that it contains three subsections that emphasize three central themes of the holiday. In the Musaf Amidah, there is a selection of 30 different biblical verses divided into three discrete sections called Malchuyot (kingship), Zichronot (remembrance), and Shofarot (sounding of the shofar). These three collections of 10 verses each speak respectively about (a) the proclamation of God as sovereign of the Jewish people and the universe, (b) God remembering the covenant and merit of our ancestors, and (c) the sounding of the shofar during the revelation of the Torah at Mount Sinai and the coronation of God as king, proclaiming God’s awesome power to all of the inhabitants of the world. It should be noted that there is a prayer that serves as introduction to the first of these sections, the Malchuyot, which speaks about the obligation of all people to acknowledge God’s sovereignty and kingship. It also speaks of a future day, when all people will acknowledge and accept the kingship of God. Called Aleinu, it includes a passage that states, “Therefore, we bend the knee and reverently bow before the King of kings, the Holy One, praised be God.” At this point, as part of the choreography of the service, it became customary to actually bow before God in a physical act of accepting God’s kingship. One of the oldest prayers in the Jewish liturgy, the Aleinu is included as the conclusion of every Jewish worship service, whether holiday, Sabbath or weekday. Yet, it originated in the Rosh Hashanah Amidah. Although not officially a part of the synagogue service, an additional custom developed in medieval times called Tashlich, which means “casting out.” On the afternoon of Rosh Hashanah, Jews gather by a body of water, recite special verses and then throw crumbs of bread into the water in a symbolic gesture of casting off their sins. Perhaps in an echo of the scapegoat ceremony, the fish are expected to eat the sin-crumbs and take them away. Whenever the first day of Rosh Hashanah falls on a Sabbath, the Tashlich ceremony is performed on the second day of Rosh Hashanah. Pronounced: ah-LAY-new, Origin: Hebrew, it is the name of a prayer that marks the end of all three daily prayer services. How to celebrate the Jewish New Year at home. Your glossary for the Jewish New Year.